Bakery, sandwich shop, and cafe on North End. It opened in November 2016. Although it has enough seating to classify it as a cafe, and it's fine to come in just for a cup of tea, all food and drinks are served in disposable packaging and you have to buy your food at the counter and clear your table afterwards yourself. Accessibility: No steps in, and a wide aisle to the counter. Chairs are not fixed, so could be moved aside for a wheelchair. No customer toilet. According to a photo on Flickr, as of c. 1985 the premises were occupied by a shop called "too" (sic). At some point it was a shoe shop called Kookaï, and a clock with this brand name was still present above the building for several years photo, though by March 2017 it had been rebranded to the then-occupant, Greggs photo. The Kookaï sign was also revealed in mid-2014 when the old 4 Feet sign was removed after its closure photo. By May 2012 it was a shoe shop called 4 Feet photo, but this closed some time between October 2013 and March 2014 photo. The premises were vacant as of August 2014, July 2015, January 2016, and September 2016 photo. 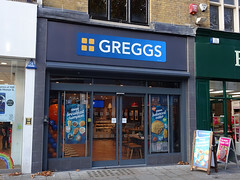 As of November 2016 it was under refurbishment to open as a branch of Greggs photo, and this was open by the middle of the month. Existence last checked in August 2018. Last edited 2019-01-08 15:26:51 (version 55; diff). List all versions. Page last edited 2019-01-08 15:26:51 (version 55).